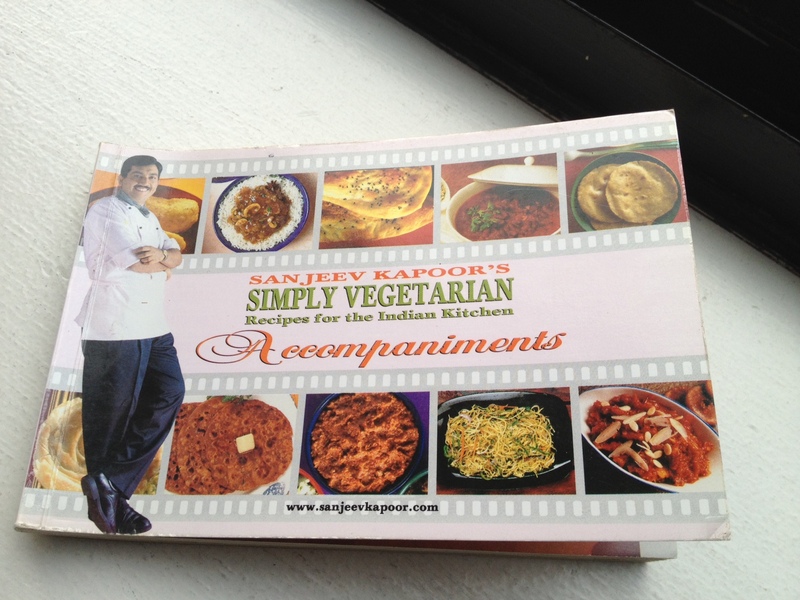 There is a set of little books in my house written by Sanjeev Kapoor, the beloved Indian celebrity chef, that belong to my husband. The books are so small and unassuming, marked Rs. 89 each, that you could miss them entirely. One of them has the title “Accompaniments.” That one I had never even bothered to ever open. That is until my mother-in-law arrived last summer and bustled around, looking for Sanjeev’s Kapoor’s kadhi recipe. “But make mine, my Gujarati kadhi,” I wailed, not entirely aware of the differences between kadhi from the north Indian state of Punjab and that from the western state of Gujarat. I knew that Punjabi kadhi had fried dumplings, but otherwise how different could they be, I thought. Both were essentially yogurt based curries that were thickened with besan. Yet the Punjabi kadhi recipe that was found in this useful little book of Accompaniments, had an entirely different tarka of fenugreek seeds-cumin-peppercorn-red chillies, and made generous use of ginger and onion. Floating balls of chunky, satisfying onion pakoras that had soaked up the tart yogurt curry added another layer of flavor and texture. The distinct onion flavor of this kadhi ensured that it couldn’t be confused with any other type of kadhi. I’ve modified the original recipe slightly – doubling the quantity of water added, and cutting down on the turmeric. Also, I don’t always have fenugreek leaves on hand, so I substitute those with coriander leaves or sometimes with nothing at all. The kadhi tastes best when served with hot, fluffy basmati rice. Note: there is deep frying of the onion pakoras here. I’m frequently intimidated at the thought of deep frying anything, but my mother-in-law devised an easy set-up. We filled my tiny 6-inch cast iron skillet halfway with oil to use for deep frying small quantities of fritters. 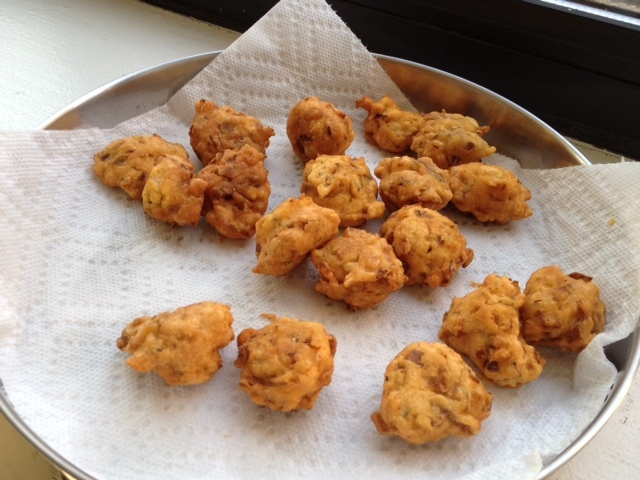 The pakoras remained halfway covered in oil as they cooked and then we flipped them over to fry the other half. This way I could discard the oil after completing a small batch of pakoras without feeling wasteful. Also the smaller set-up made the idea of hot bubbling oil seem less frightening. In any case, the frying for this recipe was quick and simple. 1. Mix the onion, ginger, methi leaves into the besan along with the baking powder, red chill powder, ajwain seeds and salt. Add about half a cup of water to form the pakora batter. The batter should not be too dry. 2. Heat the oil in a small skillet or kadai and drop in a few small balls of the pakora batter (about 1 tbsp) when the oil is hot in a single layer. Fry, flipping once or twice, until the balls are a deep golden-brown all over. Remove with a slotted spoon and put on a plate lined with absorbent paper (like a paper towel) to cool. Break one apart to see if the pakora has cooked all the way through – the center should not be too moist. Repeat until the batter is finished. 1. Whisk the yogurt, besan and turmeric until the mixture is smooth and there are no lumps. Add 4 cups of water and stir. In a heavy-bottomed pot, heat the oil and add the cumin seeds, black peppercorns, fenugreek seeds and red chillies. Add the ginger and onion and stir fry for a minute or so. Add the besan mixture to the pot. Add salt, and bring to boil on medium-high heat while stirring occasionally. Then lower the heat, and allow the mixture to simmer for 15-20 minutes or so. Stir occasionally. The mixture will thicken slightly and should taste well-cooked through without any raw taste of besan. Now add the pakoras and chilli powder and cook for 3-4 minutes. Garnish with chopped coriander leaves and serve hot. You forgot to list yogurt in your ingredients –though you do mention it in the process. 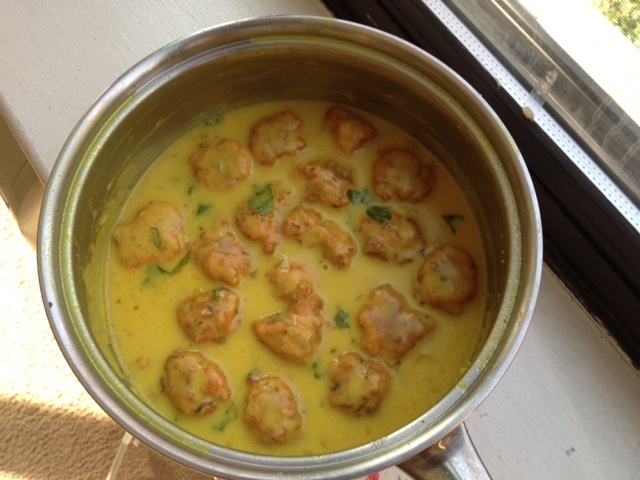 I also make kadhi, but it’s slightly different from yours — or the Gujarati or Rajasthani one. It is my grandmother’s recipe, slightly modified. niaz zaman . You are so right!! fixing it right away.